One mango plus the leafy parts of one stalk of kale equals one very sweet treat! 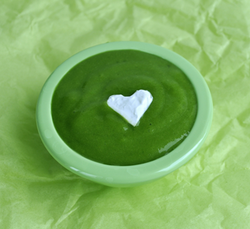 The little ones in your life will lick up every last bit of this green goodness! Blend mango slices from either 1 fresh mango or one 10 oz. bag of frozen mangoes along with the leafy parts of one stalk of kale in a high quality blender or food processor along with a splash of filtered water to help start the blending. If you use frozen mango, you'll end up with more of a sorbet. If you use fresh mango, it'll be more of a pudding. You can extend the batch by adding more mango or a banana. High-powered nutrients never tasted so good!